It's never easy discovering a serious fault with a book I originally appreciated greatly. It's never easy, and yet...what do I have to lose, really? What am I giving up when I can admit something may not be as wonderful as I originally thought? And so it is with A Fine Desert: Four Centuries, Four Families, and One Delicious Desert. I liked so much about it from the outset when I read and discussed it with colleagues last spring. I still like so much about it: The small details, the big arc, the way it looks at continuity and change from such a child-friendly perspective. 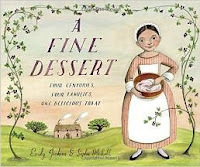 As for the much-debated way it handles the blackberry fool made in 1810 by an enslaved woman and child? I confess I glossed over much of it. The only image that gave me pause initially was the one in which the mother and child are closeted away eating the treat together. I remember asking, "How is a child reader going to make sense of that scene without any explanation?" This idea of an unmediated experience with that part of the book was particularly worrisome to me. But while I did think briefly of children of color, of Black children, and wondered if it would generate a sense of shame or confusion, I read the author's and illustrator's notes, and let my vague sense of discomfort go. After all, there is so much wonderful in the book, in both the writing and the art. That contemporary family and community at the end brought it all home for me. Yes, this is the world we live in, and I love it. So I've enthusiastically featured A Fine Desert in several talks to Wisconsin librarians. Fast forward to now. I've had ample opportunities to read various articulate opinions on the depiction of this enslaved woman and child. I've had ample opportunities to think. To consider. To learn. And I've changed my mind. I cannot ignore the voices of those who have helped me understand something I didn't consider before: No matter how thoughtful the intent was in depicting this mother and child, the end result is that it can be seen as perpetuating painful imagery of "happy" slaves. Am I ashamed I didn't see this myself? Yes. Because it's the kind of thing I'd like to think I wouldn't miss. But I'm not so ashamed that I'm going to dig in my heels. I can let go of A Fine Desert. Did I come to this decision easily? No. Am I sad about letting go of the book? Yes. But it's a small sadness. Yes, I still appreciate many other things about A Fine Dessert, but I can also accept that this is a fault it cannot overcome for me when it comes to recommending it to librarians and teachers. I think also part of the point is that they could have chosen a black family from a different time period or depicted black people at time who were not enslaved. When black children look for historical representation and representation in literature in general, it shouldn't be just of in the context of slavery. I absolutely adore Sophie Blackall's work. Pecan Pie Baby is a HUGELY important book in my life and in my family's history. Big Red Lollipop is fantastic, Might Lalouche is hilarious, the Baby Tree, Ivy + Bean... I love it all. I loved A Fine Dessert the first time I saw it, too. You're right, Megan, there is SO MUCH that is good here. And when Elisa first made her post public, I was frankly annoyed. I thought she was being overly critical. I'm ashamed to say that now, but that is the way I was feeling at the time. I read this book with my daughters. With my Black daughters. I missed the issues even of the scene that you found troubling, Megan, the scene in the closet. I looked at the author's note and was convinced. I'm so ashamed I wasn't a more careful reader for my daughters' sake. I think it is really, really hard to separate from your fandom and listen to criticisms of something you love. It was for me. But so many people have spoken so passionately, and I've had the chance to look again and again and again, and now I see what they have seen. I still love Sophie Blackall, and I still look forward to every new book she puts out. (CAN'T WAIT to see Finding Winnie!) But, like Megan, I have let go of A Fine Dessert. Thanks, Megan, for articulating this so well. Sorry to read that you have been bullied by an outraged group of people that can't even articulate their outrage beyond being outraged. I am concerned that this is the direction of children's literature discourse for the foreseeable future. It's so hard to let go, sometimes. I remember when I went to read the Little House on the Prairie to my son. These were books I just LOVED as a child. But I was so appalled by them as an adult that I just put it down and couldn't continue. But, of course, my concern was with the actual child in my home not some amorphous idea about "children's literature" needing to be protected. So in that sense, I'd like to thank the commenter above for helping me understand why this huge, ugly rift has been uncovered this week---it's between those of us who care about children and those of us who care about children's literature. How charming to find those of us who care about the experience of children as readers are the bullies. But, honestly, I'm fine with it. I'm not going to force-feed my black son racist claptrap no matter when it was written. And I'll stand up all day and shout about wanting better books for my kids and for all kids. The concerns about A Fine Dessert have been very well articulated on Calling Caldecott and elsewhere, and I don't feel at all bullied. If anything, I'm embarrassed I didn't see these issues the first time I read the book. With the criticism from African-American readers, I have come to see the book differently and have changed my mind about it. No one is saying you can't enjoy the book, Durable Goods. You are free to tell everyone what you appreciate about it. And I hope you will. I don't think the author or illustrator had any bad intentions at all. They just weren't thinking beyond the White perspective that pervades children's literature. And in the end, children's literature and children both have everything to gain and nothing to lose when we can bring those two interests together, Jenny. (Thank you for articulating that divide as you see it.) I don't find it painful or threatening to see a new perspective and accept it as an important one to me, too. (That doesn't mean I always find it easy--hence this post.) I was going to say I'm feeling "enlightened," but perhaps that's hyperbole in the other direction. I'll just say I feel more knowledgeable, more understanding of things I need to consider to be a bit better at the work I do. KT Horning. Thank you for your response. Thank you all of you for your honesty here. I almost never read blogs and I never comment, but once again I find myself writing. When I looked at A Fine Dessert, which has sold well and will probably continue to sell well, I tried to see if there was a positive side to the images that had caused so much hurt. As a white person I can never truly understand what it is to be a Person Of Color reading this book, or finding out this book was read to my children at school. What I did was think about something I do understand and imagine the impact of a similar scene on me. Smiling skeletal Irish children during the potato famine was the image that came to mind. That sounds pretty sickening. Horrible things have been done to the Irish, I would never sugar coat them for my children and I wouldn't appreciate anyone sugar coating them. Nor would it be okay if that was a repetitive image my children were shown of their heritage. Now I don't get to say what is or isn't offensive for anyone else, and sometimes I struggle with seeing the reasons behind an offense. Sometimes my pride gets in the way. Sometimes I want to take the easy way out and not think about it. I can clearly see why this book can do so much harm, and I think if anyone were to really think about it in terms that relate to them, they could see it too. This is Emily Jenkins. I like the Reading While White blog and have been reading it since inception. As the author of A Fine Dessert, I have read this discussion and the others with care and attention. I have come to understand that my book, while intended to be inclusive and truthful and hopeful, is racially insensitive. I own that and am very sorry. For lack of a better way to make reparations, I donated the fee I earned for writing the book to We Need Diverse Books. Thanks for this post, Meg. It's great to hear someone consider the greater discussion and weigh the words/intent/impact of this book, especially on those who's history is so intrinsically tied to slavery in America. This is part of what I hope that people can see from these discussions: both sides of the coin. Not a kind of "anger" or "sensitivity" from a group but the true pain felt when things like this are looked at glibly and presented to young children with no context of how to consider it. Emily, thank you so very much for this comment. I really appreciate your graceful handling of this situation, and I know others within RWW do as well. And to donate to WNDB... wow. That is fantastic! From the bottom of our hearts, please accept our thanks and for your positive contributions to this difficult conversation. Megan (+ everybody commenting here), thank you for sharing your reflections. Emily Jenkins, your courage and willingness to listen and speak to this are inspiring. I know I will learn from your example the next time I am in a similar situation - and I surely will be, as we all hold bias. We all make mistakes. And at the end of the day, we don't have to agree about everything. But we learn more about ourselves and each other when we listen, and share our ideas, and talk about these difficult issues directly. Thank you for writing, Emily. Thank you for your care and attention. There is so much about your book that is honest and truthful and hopeful, and your willingness as an author to acknowledge that it also fell short is honest and truthful and hopeful too. Those of us who are White won't succeed at understanding the perspectives of people of color and First/Native Nations individuals if we aren't open to listening and learning and reflecting on ourselves. But if we are, our understanding will deepen. That deeper understanding, and speaking up about about where we think we have fallen short and what we have learned, is in the best interests of children and children's literature both (still thinking about Jenny's comment). Thank you for speaking. I am very impressed by Emily's decision. I acknowledge that there have been some good conversations about A Fine Dessert, but I have seen so much hatred and anger thrown in Emily and Sophie's direction that it is hard to discern those who have looked at the book critically and found fault with the portrayal, and those who are simply looking to incite outrage, anger and threats of reprisal. I have lost a lot of respect for the latter group. I still personally believe that there are multiple viewpoints for the enslaved mother and daughter - no one can tell me with any certainty that the way E & S portrayed them is less than possible. They did not portray them as seated at the dinner table with the family, which to me would have engendered this reaction. I am hopeful that there will not be a "chilling effect" in the industry, but I am truly concerned that authors and illustrators will hesitate out of an abundance of caution to write and depict in a manner which is more concerned with avoiding outrage than anything. Emily, thank you for your public demonstration of moving forward. Amen, I agree with you. Would you mind sharing your daughters' responses to the book? Just curious . . . I haven't yet reached the position of some of my very good friends here, but I am still listening and trying to understand the very valid criticisms. The book just was named one of the best picture books of the year by the NY Times -no small honor remotely- thus it has passed the test from some respected scribes based in the liberal NYC market, of which my own sensibilities line up lock, stock and barrel. I definitely do see the how and why the book is seen as racially insensitive, and think that is an overwhelming gesture on Ms. Jenkins' part. I can never myself let go of the book--it is such a ravishing work on so many fronts, but I have come to see that the objections are coming from people reluctantly as they too love the book in so many ways. I will be writing a full review on it in my 2015 Caldecott Contender series. 1. Slavery wasn't cute, warm, loving or happy. 2. The only Black people in the book are slaves. Now think about how to explain this to a black child, a child at an age where their self-worth is vulnerable. I would hate to be a black child in a classroom that is reading this book and thinking "the only people who look like me are slaves." Was that articulate enough for you? While one of the great horrors of that time period was the rending of families, some families were kept intact. As a biracial woman, I would hate to think that my family's story was deemed "offensive" or unworthy of telling simply because one of my great-great-grandmothers was able to stay with her mother while in captivity. As authors, we strive to tell the stories of individual characters rather than stereotypes or generalizations. Just because many were unable to live with their mothers doesn't mean that there isn't a place for the stories of those who did. (Otherwise, we sanction the silencing of the minority-of-the-minority by the majority-of-the-minority.) I also was happy to see the child and her mother enjoy a moment of rebellion. I found it empowered the child character, which I consider a hallmark of good children's literature. And I loved the subtle message of resilience, even in the most atrocious circumstances. That's a message I'm happy to pass on to my own children. You make such an excellent point about the "repetitive image." While we can call out individual authors and illustrators for their decisions, it is all part of a larger picture in which children of color and other minorities are presented with the same narratives over and over with no other depictions to balance them. Is it plausible that a slave mother and child could have hidden away to treat themselves and maybe have even been happy in that moment? Absolutely. But are these images of "happy slaves" and slavery in general the only historical context in which we want children of color to see people who look like them? Absolutely not. This is why we need diverse books that go beyond simply including characters who are PoC, LGBTQI, of diverse abilities, etc., and encourage a diversity of experiences for those characters as well. Just as the potato famine isn't the only Irish experience, slavery is not the only Black experience, and this needs to be reflected much more in the books we write, read, publish, and buy. Thank you Emily, but I still fail to understand why she or any other must "come to an understanding" of why this depiction is wrong. Why, from the beginning, was the problem/offense not explicit? I am an African-American woman that was married to a German man for some time and one thing he never understood was how two groups of people that have lived so close to each other for about 5 centuries don't have any understanding of the other's experience. He couldn't get it and I'm still baffled as to someone who seems so open-minded, didn't understand that this was an improper depiction. What I see as a black woman is a skilled house slave training a slave girl how to be a proper house servant for the master's family. This skill actually would make her more valuable on the market, so it is important that she learns well. The master would usually have them doing small things like picking up garbage at 3 and fully laboring by 7 years old, so you have the age right. It's likely she would have never known her mother and was being trained to be a proper house slave by a woman she didn't know.The woman would likely be strict, maybe even beating the girl herself if a mistake was made on this dessert, for she too would suffer if it were not right. The girl would know she was property by then and the "beat" you mentioned would be the pace of her heart, for fear of the punishment, if she made a mistake. She wouldn't be smiling as depicted, but tired and overworked. She would have been up before sunrise and already made the master's family breakfast/lunch, skinned/prepared the necessary animals, cured the meat, cleaned/washed kitchen/cookware/dinnerware (twice over) etc., and due to work past sunset to prepare for the next day. Taste the spoon? A slave knew better. Depending on the type of master, that could get her killed if the master found out he had eaten behind them. Hiding in the closet? Sure, if they were were so bold. That would be a risky endeavor, but maybe. Now, if they were found in the closet? My God. There's no way you can make slavery beautiful, acceptable, or about family. It's not. I think we owe it to the children to let them know this wasn't a happy time ( for slaves at least) and it is unacceptable what happened.There is a way to convey this. Even something as small as not having them smile and writing that the girl was very tired and worked all day, but still she beat, beat, beat. She had never tasted a dessert before and hid in the closet licking the spoon. Such subtle changes would have made a difference and prevented this controversy. However it's all about you and your readers being comfortable, right. I wonder - if we could all agree - that this is an editorial and art direction failure. And that the personal attacks on the author and illustrator should not be tolerated. I'm African Åmerican and very bothered that the author - in her apology - decided to donate her proceeds to a diversity movement. I think that pushed the issue a step to far and it's beginning to look like extortion. Can we not have a civil discourse about how the problem got to this point and what education we can do to make sure it doesn't happen again? I said, on my social media, that I would have been less offended if the book had shown a split spread - one where the white family is being served and is eating the pie, and one where the family is in the kitchen eating another one - having reserved the best of the two for themselves. It's still slavery, but the change would have been more empowering than hiding in a closet. Still - we've reached the stage where many of my colleagues - wanting to to the right thing - are so scared of making a mistake they're almost paralyzed. This is a race war of the worst kind and I think children of all backgrounds deserve better from us as adult content providers. I think we should have scholarly discussions about how to effect positive change in the industry without villifying the content creators in the process. Christine, I agree with you on all points. I, too, have seen White people paralyzed with fear of making a mistake. That's better than people obliviously blundering about, but how do people get to the place where they can make informed decisions? One thing I always suggest is to read books by and about people of color -- and then read some more. Learn what's authentic and what's not. I can understand why so many Black readers are upset and angered by this book. Overall, the tone of both the text and illustrations is nostalgic, and it's impossible to feel nostalgic about slavery. It's also difficult to remain civil in the face of such nostalgia. Might be easier to have a "civil discourse" about the problem if we're not using racially charged (in this context) words like "extortion" to describe a simple, heartfelt apology and personal choice to do what feels right to her. Far as I know, the idea of donating her proceeds to "a diversity movement" was something she came up with herself, not something called for as a sacrifice in this "race war." Nanette, how can we talk about race without using the word? White privileges "charges" all language under the cloak of "normalcy". It sit between you and Christine on this one. Emily is taking ownership for something she is not solely responsible for, and I don't want to lose sight of our responsibility as critics, editors, publishers, to make real change. At the same time, she's taken a dramatic step that allows us to take the discussion to the next level, and I respect her choice to do so. Nanette, I do indeed know the three judges are white, and one, Monica Edinger, has always had my utmost respect, as a lifelong purveyor of equal rights and all-encompassing respect. I can only speak for myself in my appreciation for this book. Just this past week, I read another 2015 picture book to my first graders about slavery - "Sewing Stories" by Barbara Herkert (with illustrations by Vanessa Brantley-Newton) Ms. Herkert is white, Ms Newton is African-American. The book chronicles the transformation of slave to artist. Ms. Herkert included some compelling historical facts on every page about the plight of slaves. Considering the intended age group, I am wondering if this could be realistically effective, though personally as a lifelong liberal Democrat with many African-American friends, I can see the need for a disclaimer. The point is there wasn't any intent to disparage, demean or tarnish the scenario of the book, rather I saw it as a part of our shameful history. As such as a passionate advocate of the African-American experience and their rights, I saw no slur, no indignation, no breech of faith. Some of my favorite illustrators are Floyd Cooper, Jerry Pinkney, Bryan Collier, Kadir Nelson, James Ransome, Christopher Myers, all spectacular talents and beautiful human beings. Does that mean I don't feel others shouldn't have an issue? Of course not. I completely understand the hows and whys, and am only coming to the table here with a single view. There is a communal spirit in this book, a celebration of homespun qualities that were shared by blacks and whites. We can't erase our history, and alluding to it in books and films is not meant to shed a dire light on it but rather to stress the goodness in said relationships. I do think Emily Jenkins is an extraordinarily beautiful human being. Thanks so much for responding to me Nanette. Hi Nina... I'm not sure I'm understanding your question? Or perhaps you misunderstood my comment. I'm not at my best with these tiny comment boxes. I don't see any problem with using the word "race" in discussions about race. How could I? :) What I was objecting to, in Christine's comment, were what I consider racially charged/coded terms--sometimes better known as "dog whistles" that I felt she used, intentionally, or no. So the implication that a "diversity movement" is the beneficiary of something that, presented with no evidence at all, is "beginning to look like extortion" certainly raises red flags for me. As does the prospect of a "race war"... wording that's been used to frighten people for centuries. There is, to my knowledge, not even an inkling of a race war going on. There is a discussion--sometimes heated, yeah--going on in multiple places about diversity in children's books. Some of the most interesting parts being trying to figure out what diversity even means or should look like. I'm sorry to hear that some authors are fearful and backing away, but you know what? Others are stepping up and at least trying to understand and thinking of ways to not only diversify their own work (in non-problematic ways) but also to encourage and amplify the works of those writing their own stories about their own histories and cultures. Anyway, I hope I clarified things a little. I do appreciate Emily Jenkins and her apology--tough, tough thing to do, especially for a work that has been lauded in so many high profile places. But, yes, the responsibility is not all hers and I hope everyone at each step of the publishing journey is listening and learning as well. As with virtually all great works, it comes down to what the individual derives. I am white, but have been race sensitive in behalf of blacks for as long as I can remember. Not only did the New York Times praise this book, but dozens of book critics did not deem the issues brought forth here as any kind of a deal breaker. The African Americans depicted in this book were from a time period -a time in our history where slavery was practiced. A terrible time to be sure- but a time nonetheless. But why do we have to look at this as a negative intrusion? Discussions on this subject could emanate in a constructive manner. As they are growing up children will be taught to understand racial tolerance as a result of our past. The characters in the book were not painted in the disparaging way that a few seem to believe. K.T. Hornung is admittedly quite right when she asserts that the book is "nostalgic" and that "slavery can never be such. But this was not a book about slavery, it was a book about four different time periods, with one taking place in 1810 South Carolina. Is the author supposed to candy coat the accepted social order as abhorrent as it may be simply because of the reference point? This book is a period piece crossing generations and countries. What if the narrative were to include Germany in 1945 or South Africa in 1980's? Our past shouldn't be hidden or glamorized. The lesson to learn is that this can never happen again. But Emily Jenkins has spoken to a communal theme, universal in scope and humanistic in substance. I just looked at the book again with my wife, and I must say no power in the world would ever let me put it aside. It has well earned all its critical plaudits and reverence from picture book lovers around the nation. I will be proud to read it to my class again tomorrow in fact. Kel, there have been many, many books about blacks that are not about slavery. Probably in upwards of 90%. This book just happens to include an accurate representation of the 1800's as one-fourth of its presentation. It is part of our history. A terrible part of our history to be sure, but something that shouldn't be swept under the carpet if the author chooses to examine that period in total or in part as was the case here. There was no conscious exploitation here, this was a "period piece." What even is this: "I am white, but have been race sensitive in behalf of blacks for as long as I can remember." Black people don't need white people to be "race sensitive" on their behalf. They need to have their voices and their experiences respected. Also ... so what? What do you think that even means?! This is alongside "well the NYTimes liked it." Yes, let's see who wrote the beautiful review for them, shall we? Oh, John Lithgow! Well then! He's a noted children's book scholar AND dude from 3rd Rock from the Sun! The NYTimes doesn't get some automatic THEY CAN'T BE WRONG. The fact is, no one does. And I am grateful for that. We all should be. No one is saying this book should be banned or never shared with children. Literally no one in any of these discussions has EVER said that. No one is saying that children shouldn't be involved in hard conversations. What they ARE saying is this book is NOT engaging in those conversations and is, instead, glossing over those conversations and, if anything, THAT is the insult the children - not this supposed boogeyman of "sanitizing history." Read it to you class and then try to engage them critically about it. Ask your class why it uses "master" but "mother and child" instead of "enslaved mother and child". Ask your class if they know why the enslaved mother and child had to run and hide and what would happen if their OWNER had caught them. Have that convo with them. Nanette, thanks for the clarification. In my first paragraph of reply, I did misunderstand you, and completely for my own fault. I also have trouble with these little boxes, as well as little teeny bits of time in which I'm trying to read and respond. I frankly don't care if someone doesn't need or want my support, I am mentioning it here because as a 33 year teacher in an ethnically diverse community, presently working in a school where my wife is principal, I consider race equality and race injustice to be as important as anything else in my focus. As far as your disingenuous comment "What do you think that even means?" I assure you I wasn't trying to convince "Ann Gianfredi" of anything. I wasn't speaking to you directly I was stating my long held social beliefs. As far as your rant about my NY TIMES assertion I think you missed the entire thrust. I wasn't talking about John Lithgow's review I was talking about the fact that a few days ago the NY TIMES Children's Book Review panel chose A FINE DESSERT as one of the ten best children's books of 2015. By all means avail yourself of that announcement as soon as you feel satisfied that you've trashed John Lithgow in your failed effort at sarcasm. But after you read about that designation please be sure you read both reviews in the Horn Book (one an extensive rave from Robin Smith), the effusively favorable review in School Library Journal, and similarly over the moon reactions from Publisher's Weekly and Kirkus Reviews. When you finish with those go on line and read the other two dozen or so reviews from other publications, all of which offer nothing by unreserved praise for this beautiful book. The truth is there isn't really a negative review out there and certainly nothing that matches up with some of the criticisms on this thread. So no, the NY TIMES is really only a small part of this glowing equation. I didn't say that anyone implied that this book should be banned - I wouldn't even ponder such an act of censorship in my worst nightmares - YOU chose to make such an extreme analogy. I argued about this book employing the terms others politely posed. As to your comment starting with "What they are saying that children shouldn't be involved in hard conversations....etc.," we'll just have to agree to disagree. The notion that smiling faces confirms the mental state of slaves is frankly preposterous and I do NOT buy the proposition that young kids will interpret it that way. Your urgings to me in the last paragraphy are ludicrous with all due respect. I just finished saying that this book is NOT about slavery. It comprised a fraction of the entire scario and has nothing to do with the theme. "I am concerned that Jenkins’s apology has tainted this beautiful book. To depict a slave mother and daughter smiling while sharing a tender, secret moment together is not something that should be generalized as showing “happy slaves.” Jenkins could have offered an explanation or an appeal for deeper exploration of the story instead of caving to the critics. Illustrator Sophie Blackall, on the other hand, has offered a rational, thoughtful explanation of her illustrations, including how long and hard she thought about the smiles. A Fine Dessert is a wonderful book that can foster discussions among families, teachers, and students. I’m glad Blackall has Finding Winnie for the Caldecott committee to review, because now they won’t touch A Fine Dessert with a ten-foot pole. What a shame." Yo I don't engage with people who don't bother to even read my name correctly. Grow up, "Sam Juliano." Oh I should "grow up" because I honestly misread your name Angie? I am 61 in any case. But by all means concern yourself with name calling instead of the discussion at hand. You're a moderator at this site, and this is the way you talk to people? You came in like gangbusters questioning my sincerity, and misinterpreting what I said, and now try and dismiss the entire affair by citing a genuine name error. Right. Extortion? Thank you, Nanette, for addressing that in your comment (below). Thank you, Solaris, for bringing that particular context to the discussion. What it does, is shift the conversation away from "the dessert" to the lives of the people. That is vitally important. Most of what I see is people celebrating the idea of the dessert. And making it. The book is very much a feel-good story way to give a nod to slavery but with that final scene, suggests all is well, when it is so far from well. Society is so far from well. The discussion of this book captures that rift so well. And given that the majority is in the "love the book" space, it keeps us from moving forward as a society. It lets people think injustice wasn't that bad, and, anyway--it happened long ago. See us all eat together now? Very disingenuous. Sam, you have actually hit on something that I think is at the crux of this discussion -- that the book had received glowing reviews. But all of these glowing reviews have come from White people, and many of them are socially conscious White people at that. I myself was among them. And both Emily Jenkins and Sophie Blackall have a long record of creating great multicultural books. I admire both women's work a lot. Where we see a difference of opinion is from many African-American readers who have a completely different take on the book. As the NPR article last week noted, they feel it whitewashes slavery. And surely there were times when enslaved people shared a smile, particularly, I would imagine, between two people who loved each other like a mother and child. But those smiles don't represent the harsh realities of slavery. Some White people have argued that it would be inappropriate to put the brutality of slavery into a book for young children. I would argue that if that's the case, then perhaps these children are not ready to learn about this part of our history yet. But if this book is the first introduction a child has to slavery, the idea they will likely get is that it wasn't really so bad. They look happy enough. They're healthy, clean, well-dressed and smiling. They have a nice, warm place to live. And the child has her mother, which sadly was not the case for most children in slavery. Thus the charge of whitewashing. And they may have to spend a lifetime unlearning those misconceptions. In fact, most White people in this country grew up with the image of the "happy slave" entrenched in our brains (think Gone with the Wind, Aunt Jemima) and I daresay that is why none of us recognized a problem with this book in the first place. One other issue I'd like to clear up. People keep talking about this book like it was a shoe-in for the Caldecott -- until now. That is something we can't know. We don't even know if any of the 15 people on the Caldecott Committee have suggested or nominated it. And if they have, they might, in the end, choose not to give it the award for reasons we haven't even discussed. Or there may simply be five or six other books they feel are stronger. We can't know any of this because all the proceedings are confidential. Even members of the Caldecott Committee have no idea at this point what is likely to win. I think overall this has been a healthy, vigorous and necessary discussion. I've learned a lot from reading the different points of view on the book. K.T., your vital points are admittedly irrefutable. While I hold steady to my own views, and do feel the book has so much to offer children on a number of fronts, I completely understand why some African-American readers would give pause, and for me that is alas troubling in the big picture. Hence your second paragraph addresses the central issue fairly and perceptively. I continue to feel that the book isn't about slavery, but rather that slavery intruded in a part of the narrative. But yes it is there, and as you note in your magnanimous wrap the discussion here has helped to bring disparate views to a common ground of understanding. Thank you so much for responding to me here. I have always greatly respected your humanist views and authoritative grasp of children's literature. As to whether the book will still be under the Caldecott radar it is hard to say. I'd say everything you say in regard to that is dead on. Thanks again. Convenient for white people to 'move forward' regarding slavery isn't it. I see a tender moment between mother and daughter. The book does not shy away from the topic of slavery- it shows small children working, wearing patched clothing, having to hide away in the cupboard to have some desert. People need to remember that this is a picture book for very young children, who on account of their age, should not be presented with the complete nature of slavery. As an adult accounts and images of slaves horrify me, so how much more would the complete nature of slavery distress very young children? The book does not avoid the topic- it just introduces the issue in a way which would draw curious questions (why are they hiding? who are they hiding from?) from children, which can then be explained by the adult reader. It makes me sad that after all that you have read here and other places that you would still read this to your ethnically diverse class. That you love the book is clear, but if there is any potential truth in the argument that this book can shame and hurt children then it seems inappropriate for it to be read in a classroom. I'm white, and although the book has lots of great things about it, I'd be very angry if any of my children had this book read to them in their classrooms. If people want to get the book and read it to their own children, that is up to them, but I hope my children's teachers would be more sensitive about what they pick. Blackberry, Fool and slavery? You people were asking for a controversy. If you look at the English Wikipedia page for fool you will see the basis for the illustrations. Personally, i am linking the transfer of technology to deep fried batter, which is universal. While I completely respect and sympathize for all the views expressed here, I cannot myself take a position that is the opposite of what I feel myself about the book. If I honesty thought this book would "hurt and shame children" I would not read it to them. Alas I do not feel that way myself. The book is NOT about slavery, but slavery is part of the narrative. I never and still do not consider the smiling faces of the slaves to indicate what a number of the commentators here believe -that they have accepted their plight. This was a book about camaraderie during a shameful time in our history. It was about engagement, sharing and accomplishment. It is about a specific communal activity, it is NOT an acceptance of the worst abomination in our history. Young children will grow and as they do they will learn about this sin from our past and will grow from it. I see the reaction to this book from some as a needless and unearned complication that has sadly tainted the actual intent. So yes, I can read this book to my ethnically diverse students as enthusiastically as I have read books like Floyd Cooper's "A Dance Like Starlight," Christopher Myers' "Firebird," Angela Johnson's "All Different Now," Patricia Powell's "Josephine" Katherine-Russell-Brown's "Little Melba and Her Big Trombone" and numerous other magnificent books about the African-American experience that feature terrible reminders from our past. While it is true that all these books focus on overcoming racial injustices, they also examine coming to terms with who they are, what they would like to be, and how they connect with all they come in contact to. There are a number of ways you can reading the smiling faces in A FINE DESSERT, and I choose to see it as a gleeful response to this wonderful activity, not as a general commentary of their situation. The vast majority of younger kids have and will see it that way too, and years later will come to understand the implications of our shameless past. I remain in full respect and understanding with those who do not see it the way I do, including yourself. I almost never censor anything, and this book to these eyes is light years away from such an act. I must appreciate your engaging with me here my friend. Honestly, Jonathan, I wouldn't answer that question if you put it to me. This is going to sound harsh, but based on prior interactions with you, you would find a way to dismiss the answer. The space that you're in is so resistant to making space for voices of other in meaningful ways. I've also read both sides of this argument (as well as the book in question), and it seems like in this area, white authors are damned if they do include diverse characters (because the characters are not portrayed "sensitively" enough, or are whitewashed, or are "token" minorities) and damned if they don't (because they aren't being inclusive enough). If Jenkins had written the book with a free black family, you can bet she'd be accused of "glossing over slavery" by the same people who are accusing her of making it seem pleasant because the little girl is smiling while picking berries. I am closely following this discussion and trying to understand as much as possible, but the Slaves depicted in the second episode are not the only Black people represented here. "I am an African-American woman that was married to a German man for some time and one thing he never understood was how two groups of people that have lived so close to each other for about 5 centuries don't have any understanding of the other's experience. " Really? It seemed strange to a German man? Because by 1938, Jews had been living in the lands known as Germany since AD 321. This is not a problem peculiar to the US. Dominant groups don't have to understand subjugated groups, so they don't. As an educator, teacher and parent, I'm truly sad and disappointed things like this keeps happening. Worse, white authors and illustrators are simply given a pass by their racism by simply saying sorry. Why not just just pulled the book off the shelf completely and give the money to Title 1 schools to either buy books for their library or pay for more staff. This author apparently have lived a life far removed from people of color or worse believed that slaves were happy. The problem unfortunately is not just the author and illustrator but the publisher who didn't review this book well. The reason for their failure is sadly is probably similar to the author and illustrator...living in a white world where people of color are in the shadows and not given an opportunity to work in the "white world" of publishing or anywhere that doesn't follow their narrative beyond the "happy slave." Not surprising that the author and illustrator are two white women....depicting black women this way. Kamryn. Did you see that there are the black neighbors at the final spread of the book? I have been educated about this book by people like Elissa, Ebony, and Megan (and many others) and learned to see the huge issue in the 1810 episode. However, I think it is still important to be accurate when we critique and do not misrepresent details since many people who might read these comments might not get to see the books themselves. To advance fruitful conversation and exact change, I implore everyone to base our opinions on factual evidences. I am not black and I am not white, and I believe that moving forward here means to tackle the bigger picture, to continue working on addressing issues, not to give up and think that everything is peachy, which it isn't. I am curious as to what other actions you'd recommend in this particular case? I have to agree with "Disappointed." While I appreciate the author's apology, I have to ask if scenes of the Holocaust would be whitewashed into a rosy glow. Would Jewish children be smiling while serving their Nazi captors in a children's book? And lest you think I'm exaggerating, please understand that I lived through the period known as segregation. Unfortunately, far too many people dismiss that time period, jumping from slavery until today without realizing just how much the images and ideology from segregation still color how race is perceived today. The jovial imagines of Aunt Jemima and Uncle Ben are still on local supermarket shelves, without regard to why those images still remain or why Jemima and Ben are dubbed "Aunt" and "Uncle"
The familiarity and comfort of these icons (Aunt Jemima and Uncle Ben) come to mind when looking at the artwork and written words for this section of the children's book. While I can certainly understand the hesitation to dismiss the entire book on this one section, the publisher's inaction on this will probably be in line with other books with questionable, and frankly, insensitive depictions of minorities. That, is, to essentially do nothing but issue a statement on opening a "dialogue." By all means, lets have a conversation. But first it might help to start with letting go of code words like "PC" and realizing that respect and dignity for another culture have nothing to do with being "politically correct" but treating others as you and yours wish to be treated. In that regard, I'm going to state this loud and clear. "Black lives MATTER." It's not just a hashtag or a chant for some of us. In its simplest form it can be used to open an educational dialogue for those who don't understand why the images in this book are offensive, and why the African American experience in America is not just black history, but American history. The concept that happy slaves are a terrible thing to depict has been clawing at me. That sentiment has come up several times in recent months. I have wrestled with how I feel about it, and I have finally solidified my position: There is nothing wrong, per se, with showing an enslaved person being happy. We humans, all of us, are remarkably resilient. I have seen people in the most wretched third world circumstances expressing pure joy. We cannot be miserable every minute and survive. To show enslaved people as fully resilient humans who are still able to find moments of joy in their lives can be both respectful to the memory of slaves and realistic. What would be unacceptable would be to depict slaves happy ABOUT being enslaved. This book, A Fine Dessert, shows a mother finding a way to let her child share in the sweets and for them to steal a happy moment for themselves. Children are naturally happy if at all possible, and they need bits of carefree happiness. So this scene is showing a good, loving mother. She is not a happy-go-luck simpleton perfectly happy to spend her life serving her master. She is a resourceful and resilient parent. This scene in no way implies that it is okay that that woman and her child are chattel slaves or that she is at all happy with that fact. Another point that I think is crucial is that tragedy and suffering is not part of many books for small children, and, unless slaves can be depicted in books for children as less than miserable, the unfortunate truth is that African-Americans will be mostly washed out of children's historic fiction set in the U.S. before the Civil War. Better to bring the uncomfortable facts of the past into the open. Children do have to learn the truth of history. But, particularly for small children, I do feel slaves need to be depicted as strong and admirable people worthy of empathizing with and respecting. In this particular book, the modern African-American family living a normal life at the end is essential. Children the age targeted by this book have a hard time with reversible thought. A small, relatively gentle introduction to the concept of slavery, tastefully done, can be acceptable. Afterwards, though, it must be made clear that nowadays all Americans (all people, really) are fully equal with the same rights, and we can be friends now on equal footing. The past happened, but it was in the past. Actually, think about the movie, Life is Beautiful. It is about the holocaust and a the enormous lengths a father went to to protect his child's happiness in a concentration camp. Regarding "Aunt" and "Uncle" as titles, that is a common convention in the South. Many white people as well as black will call an unrelated or distantly related elder "Aunt" or "Uncle." Black people still do that, and so do many whites. That convention is, IMHO, two things at once. It is, as you say, an alternative to calling a black person the formal title of "Mr." or "Mrs." But it is also a term of endearment and a title of respect given to an elder whom a younger person would not call by their first name and whom is too familiar for "Mr." or "Mrs." to be appropriate. The Diary of Anne Frank is about a young girl's ability to find bits of happiness and optimism in terrifying and miserable circumstances. Just an example that came to mind. As I said elsewhere, I see resilience and an ability to find moments of joy whatever your circumstances as a sign of strength to be admired. I respect your well articulated ideas and add mine only as food for thought, not to be dismissive in any way of your viewpoint. Throughout this current discussion I've been troubled every time there was a comment along the lines of "there never would be a book featuring smiling people in a concentration camp" because it made me think indeed of the movie "Life is Beautiful." An observant Jewish colleague took me to see it certain I'd love it, being the child of Holocaust survivors and victims. I hated it. It made me sick to my stomach. Because it is impossible. A lie. But I stayed quiet to my friend and to others as it seemed to strike a chord for many for reasons I still can't quite understand. "For example, Roberto Benigni's "Life Is Beautiful" really annoyed me. A crazy (sic) film that even attempted to find comedy in a concentration camp. It showed the barracks in which Jews were kept like cattle, and it made jokes about it. The philosophy of the film is: people can get over anything. No, they can't. They can't get over a concentration camp. "Spiegel: But the film has deeply moved a lot of people. "Brooks: I always asked myself: Tell me, Roberto, are you nuts? You didn't lose any relatives in the Holocaust. You're not even Jewish. You really don't understand what it's all about. The Americans were incredibly thrilled to discover from him that it wasn't all that bad in the concentration camps after all. And that's why they immediately pressed an Oscar into his hand." Of course, one could also make the same criticism of some of Brooks' own films, and their depictions of the experiences of Black Americans. And maybe this is part of the privilege you're alluding to, Monica? The dynamic in which white American Jews use our own experiences of oppression as justification or excuse for ignoring, or appropriating, or undermining the experiences of others (including Jews who are not white)? This is a dynamic I've seen *a lot*, too. In all honesty, it's a dynamic I thought was very present in discussions of The Hired Girl as well. And (if I am reading you correctly) I agree that having experienced oppression doesn't in any way preclude us from misrepresenting the history, and present, of other people-- or from benefitting from those misrepresentations. You don't have to turn to the movies to find cheerful folks in the Nazi death camps. There was, in fact, a picture book published in the late 1980s called "Let the Celebrations Begin" by Margaret Wild and Julie Vivas. It was quite controversial when it was published. And like "A Fine Dessert," it had its champions and critics. They reissued "Let the Celebrations Begin" in 2014 -- I remember being startled when I received a copy (among others from the publisher) being aware of the controversy around it. Sarah, hopefully my blog post provided a sense of my perspective. I don't feel that I have "experienced oppression" as a Jew at all. I definitely know my parents did in Nazi Germany, but even they (as I wrote on my blog) would not have subsequently equated their experience with African Americans. And on a somewhat lighter note --interesting quote from Brooks. I actually also found the musical version ofThe Producers discomforting for its generalizing German-bashing -- that is, German=Nazi -- in that setting. Used to be all you needed to hear was a German accent and you would think --Nazi! --- in such things. Given that I was surrounded by the same sort of German accents (my father's especially), it grated. In the end it is as Adichie said so eloquently --- there is no one story.